The Santa Clarita Historical Society commemorated the 89th anniversary of the St. Francis Dam break with a lecture and bus tour. The presentation began with a history of the dam at the Saugus Train Station. 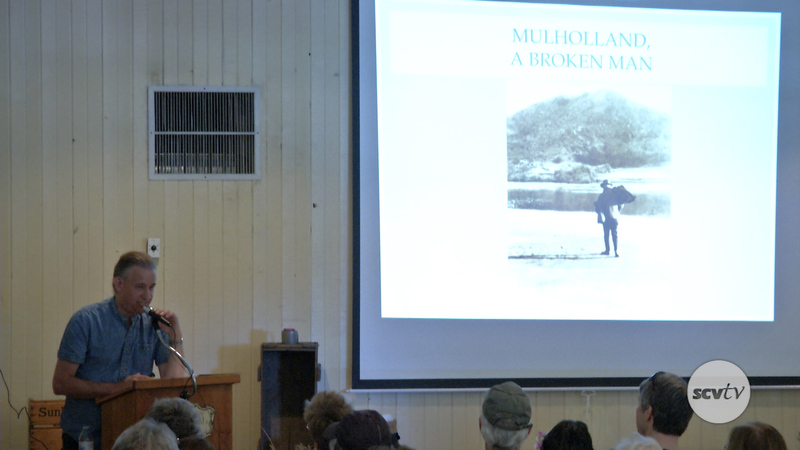 Speakers for this year’s event included St. Francis Dam expert Frank Rock, Santa Clarita Valley Historical Society President Alan Pollack and Santa Clarita Valley Community Hiking Club Executive Director Dianne Erskine-Hellrigel. Following the lecture, attendees boarded a bus for a trip up to the dam site in San Francisquito Canyon and a hike to the dam ruins. The tour included a one-mile hike in steep terrain. Thank you for posting the lecture as I was unable to attend. Well done and enjoyed it very much. My mother as a young girl, her four siblings and their parents/my grandparents lived in Santa Paula at the time. Fortunately they were residing on 6th St. just across from the high school and out of the main flood zone. I am always trying to find out more info as they did not speak much about this chapter in family history. My Grandfather Leonard Cesena’s 15yr old younger brother was killed in this disaster. Thank you for Keeping our lost family history not forgotten.